The Overall goal of the CAL programme is to strengthen the PELUM-Kenya organizations’ involvement in campaign, advocacy and lobbying so as to grasp the collective opportunities available in the network through the power of synergy to stand up against policies and practices that oppress the small scale farmers. To generate and identify appropriate technologies with member organizations partners and communities to enable them make informed decisions on use of technologies that embrace ecological land use management practices. Emergence of strong seed security systems so that small holder farmers in different zones in Kenya declared their areas as seed diverse and GE free zones. 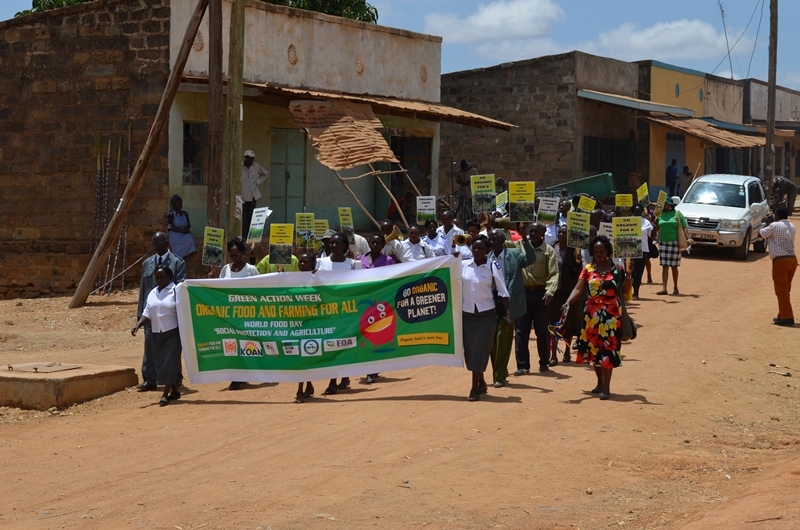 PELUM-Kenya has been actively participating in raising community awareness on issues of agro fuels. A Study on the Kenyan situation was carried out as a way to establish the extent of agro fuels adoption, promoters and the existing effects to the small scale farmers (by PELUM-Kenya). This will enable communities within Kenya to make informed choices on whether or not and the scale to which they can adopt the agro fuels. They will also be in a position to influence agro fuels policy drafting ensuring they make known their concerns to the policy makers. In the wake of reality that climate has changed and that some of the changes may be irreversible, PELUM-Kenya continues to raise the level of knowledge of its member organizations on aspects of adaptation and mitigation. Plans have been drawn so as to encompass activities geared towards community’s participation in alleviating the negative effects of climate change such as massive tree planting around water catchment areas, use of energy saving technology, water harvesting techniques among others. PELUM- Kenya has also developed networks with other like minded development partners to explore the skills, techniques and other resources available for a massive counter reaction towards the bloating climate change complexities. This is an Initiative in the three East African Countries (Kenya, Uganda & Tanzania) and Ethiopia. It aims at setting into action grassroots farmer organizations and key stakeholders in protecting their heritage, their culture, their knowledge and their rights towards food security, seed saving and improved livelihood. Each of the Countries has organized and held a workshop where the concept of NPOL issues were introduced in the Eastern Africa countries. PELUM- Kenya has continued to support its members and stakeholders working in the areas of trade. In a CAL workshop held in Malindi in February 2007, PELUM members appointed Resource Oriented Development Initiatives (RODI) Kenya to spearhead the EPAs campaign on behalf of the members. The approach is to enhance awareness among the farmers and their institutions in Africa so that they can work towards merging into one sub regional block equivalent to the ones in Europe and America for greater influence. The second phase of PENELI II which is scheduled for 2014-2016 aims at improving livelihoods of Small scale Farmers working with member organizations through application of elum practices and networking. The application of these practices will require policy support mechanisms in order to maximize their potential, and civil society organizations must apply their considerable political influence toward achieving these conditions. We want to work with member organizations and partner organizations to tackle critical problems at the county, national and international level in application of elum practices to ensure that policies are supportive to elum practices are in place and implemented.